4 hours and 15 minutes of insanity. This is tennis at its best. 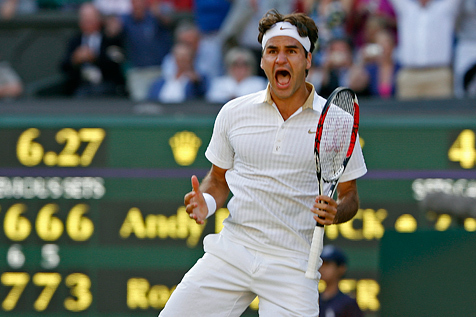 If you thought Roger Federer vs Rafael Nadal at Wimbledon 2008 was astonishing, then what would you say about the battle that just got over? Who would have ever thought in their wildest dreams that an American who last won a Grand Slam way back in 2003 would be the one to challenge the might of Fedex? Anybody who saw the match would say Andy Roddick was chosen by God himself. But then Federer had the last laugh, probably at God himself. Such was the greatness of the match. This is what a friend on FB had to say about it, “Federer, you are a legend. But Andy, you won thousands of hearts today. What a performer!”. Absolutely true. Russell ‘Gladiator’ Crowe was among the numerous celebrities present at the event. But even he would agree Gladiator is a term that no longer applies to him, rather to a man from the Alps who fought his heart out. Sir Alex Ferguson also present there, might have sold off Ronaldo and signed Owen. But even the combined greatness of the two could never match that of Roger Federer. I’m sure he would have wished more than once during the match, that either Federer or Roddick was not a tennis player but a footballer. But the person in the stands who mattered more than anyone else was the Legend himself, Pete Sampras. It was his record that Federer was chasing. Something that he did achieve after a marathon 5-7, 7-6, 7-6, 3-6, 16-14 match. Yes, you read it right, 16-14 in the final set. When was the last time you were witness to something like this. Before this match, I was also among many who questioned the ability of Federer. Of course, it is easy to say it was Nadal’s absence and not Federer’s brilliance that has made him a 15 time Grand Slam champion. It may be true. And it does look at the moment that Nadal might the only person capable of bettering Federer. But till then at least, it would be safe to say, “Roger Federer – The greatest man to have ever held a tennis raquet“. I’m sure that is something even the likes of Bjorn Borg, Rod Laver and John McEnroe would agree. Hell, even Sampras. What happened today at Centre court was not just a great match, it was history being made. I don’t think you will ever get to see anything this thrilling in any sport, let alone tennis. 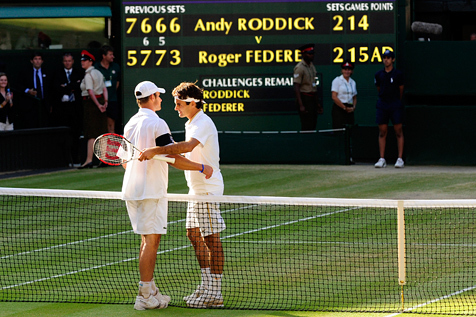 Federer won the Championship; Roddick won the hearts. Greatness was not Federer. Greatness was not Roddick. Greatness was the match itself. Michael Owen playing alongside Neville, Rooney and Scholes not just for England but also for Manchester United. Is it possible? 24 hours ago the answer may have been no. But it is now onfirmed that the injury friendly striker has penned a deal with the Reds that will keep him at Old Trafford till 2011. He will become only the 4th player in history to have played for both United and their sworn enemies Liverpool. Honestly, being a Red Devils fan I really don’t know whether to take this new move positively or not. Sir Alex has sure made a huge gamble by signing him. Owen sure has had a roller-coaster career. A boyhood Everton fan, he went against his father’s wishes to join Everton’s mersyside rivals Liverpool. During his time at Anfield, he was regarded as one of the world’s most feared strikers, having netted a staggering 118 goals in 216 appearances for the club. But in 2005 he made the biggest blunder of his career by moving to an already star- studded Real Madrid. Mostly benched and under-performing, he was sold off to Newcastle United later. His time there was injury ridden and he rarely showd glimpses of his much talked about prowess. The Magpies however were relegated this past season and Owen has found himself without a club to play for. Hull City were first to publicly acknowledge their interest in the player. There had also been offers from Tottenham, Portsmouth and Stoke City. 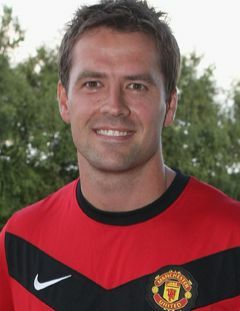 Michael Owen will be keen to fill be keen to fill in the void left by the departures of Cristiano Ronaldo and Carlos Tevez. Sir Alex Ferguson will be hoping that Owen would don a similar role like that of Henrik Larsson two years back. The former Swedish captain had joined United on a 6 month long loan deal after stunning spells at clubs like Feyenord, Celtic, Barcelona etc. Despite being in the swansong of his career, Larsson was able to help United to a League Championship while providing useful guidance to youngsters like Rooney and Ronaldo. One should also not forget when a 35 year old Edwin van der Sar was signed by Fergie there were quiet a few eyebrows raised. Since then, van der Sar has proved to among the best goalkeepers in Europe. Fergie had even called him the best keeper at Old Trafford since Peter Schmeichel. United legends such as Eric Cantona and Laurent Blanc were similar signings too. As you can see, Owen can definitely be at comfort with the club’s history with ‘finished’ players. However he will have to see that his fitness doesn’t turn out to be a roadblock. The best thing to expect from the striker though, will be a goal against his former club and United’s arch-rivals Liverpool. Now, that would be mouthwatering.